Target: Private sector stakeholders working in agriculture and digital; governmental institutions in both fields; youth working in business and social enterprises. 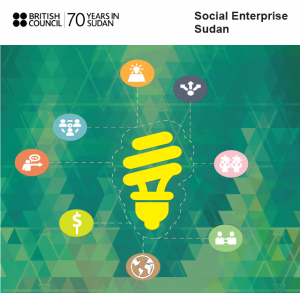 The talk is part of the British Council Social Enterprise Sudan project started in May 2018, and aims to promote social enterprise widely and contribute towards the development of a more inclusive economy. The project works to enhance the capacity of intermediaries and social entrepreneurs to support and expand social enterprise across Sudan. showcase successful stories in both sectors in relevance to social entrepreneurship. The talk also aims to help and enable the youth and private sector in Sudan reap the digital benefits form the global growth in the digital economy particularly for Sudan’s Digital Natives. The talk will therefore help the youth constructs an “ideal role” for their future in Sudan and outlines how performance can be evaluated in pursuit of the goals in the future. There are clearly opportunities for the private sector in Sudan to support and enhance the process of transforming Sudan to advanced, knowledge-based society led by sustainable innovation and social advance. The talk will discuss various topics relating to social enterprise which include but not limited to the general issues on social and cultural perspectives on entrepreneurship; sustainable entrepreneurship and finance; sustaining family business across the generations; creating value to people and the planet: motivations and the role of connectedness for creating a sustainable venture. We will discuss about young people small ideas from rural areas and marketing their ideas to urban area and moreover, issues relating to unemployment globally and the ‘youth bulge’ and how youth entrepreneurship can help address them. Other topics which will be discussed in the talk will include the importance of adequate human skills and training programs to empower the youth and critical for building capacity for the knowledge economy; creating an enabling environment for technological learning and innovation; building ICT capacity for bridging the digital divide and encouraging knowledge transfer; building capacity for appropriate technology which is economically and environmentally sound; do not require exotic sources of capital in order to develop and grow; and finally the important role of regional scientific co-operation among countries.